A mixed reality company that allows consumers to virtually “try on” home décor products in their own homes has been awarded a major investment by John Lewis. Award winning Manchester based business DigitalBridge, which was recently named Partners’ choice at the high street giant’s accelerator JLAB awards in London, was granted £100,000 after impressing senior executives with the commercial potential of the design tool. The investment comes after a successful in store trial with John Lewis as part of the accelerator programme, and according to CEO David Levine, will allow the company to accelerate its growth and development. 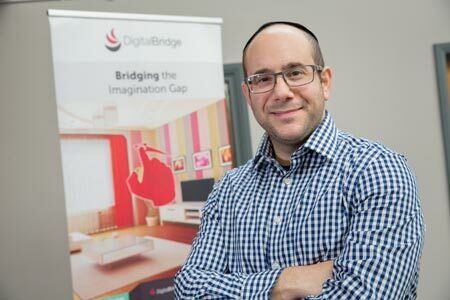 DigitalBridge received the investment after revealing the importance of bridging the “imagination gap” among consumers – which occurs when customers delay purchases because they can’t visualise how something will look in their home. A YouGov survey commissioned by DigitalBridge during its initial start-up phase revealed that 70 per cent of customers had experienced this problem in the past, with many saying the mental block has stopped them making purchases. DigitalBridge’s virtual design tool, which can be integrated into a retailer’s own website, allows customers to place products within an image of their own rooms, allowing them to preview purchases before making a decision. David and his team have been refining the app for the past 12 weeks at John Lewis’ HQ in London, where they have been receiving advice from senior executives at the retailer. In-store trials of the product, which were conducted as part of the JLAB programme, highlighted the importance of new technology in the retail sector, with more than 80 per cent of customers stating the tool would make them more likely to make a purchase on the day. David, who started the business in 2013 and has since grown it to a team of 12 researchers and developers at Manchester Science Park, added: “Computer vision and the type of technology being pioneered by companies like DigitalBridge have real commercial potential for retailers. “As more and more customers look to make purchases online, allowing them to visualise how a product looks in their own room will give retailers a massive advantage over their competitors. “The UK furniture market is worth about £10.9bn – or 1.9 per cent of GDP – if you consider that thousands of people are delaying or deciding against purchases because of the imagination gap, there is a significant commercial benefit to developing this type of technology for the retail sector.